Today on my blog we have the wonderful author of The Woman Behind The Waterfall, Leonora Meriel. To tell you more about her, she grew up in London and studied literature at the University of Edinburgh in Scotland and Queen’s University in Canada. She worked at the United Nations in New York, and then for a multinational law firm. During her years in Ukraine, she learned to speak Ukrainian and Russian, witnessed two revolutions and got to know an extraordinary country at a key period of its development. In 2008, she decided to return to her dream of being a writer, and to dedicate her career to literature. 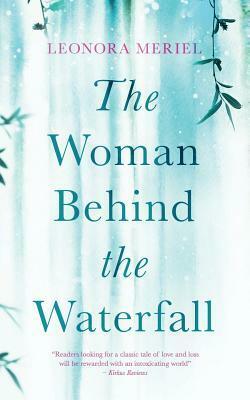 In 2011, she completed The Woman Behind the Waterfall, set in a village in western Ukraine. While her first novel was with a London agent, Leonora completed her second novel The Unity Game, set in New York City and on a distant planet. Leonora currently lives in Barcelona and London and has two children. She is working on her third novel. 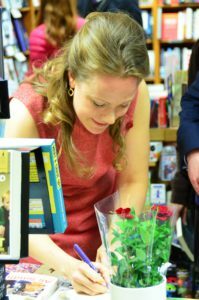 Her book The Women Behind the waterfall is about heartbreak and transformation in the beauty of a Ukrainian village. For seven-year old Angela, happiness is exploring the lush countryside around her home in western Ukraine. Her wild imagination takes her into birds and flowers, and into the waters of the river. All that changes when, one morning, she sees her mother crying. As she tries to find out why, she is drawn on an extraordinary journey into the secrets of her family, and her mother's fateful choices. Can Angela lead her mother back to happiness before her innocence is destroyed by the shadows of a dark past? Beautiful, poetic and richly sensory, this is a tale that will haunt and lift its readers. I had always wanted to be a writer since I can remember, but it was not until I turned 30 that I started writing professionally. I had always written stories and poems and even some novels, but when I got to 30 I realized that if I truly wanted to achieve my dream, I had to give it everything. That was when I quit my job and threw myself into writing. Since then I have written and published two novels and am working on my third. 2. Can you please tell us something about your new novel “The Woman behind the Waterfall”? What prompted you to write it? The Woman Behind the Waterfall was inspired by two things. When I started writing it, I had been living in Ukraine (Eastern Europe) for ten years, and I had got to know the country intimately. It was a country that very few people know anything positive about, and I wanted to write a book that portrayed the beautiful countryside and the rich culture of the land. The second inspiration was turning 30. I felt that I was at a crossroads in my life and I looked to my mother and her life choices and I looked to my young daughter and thought about the choices ahead of her, and how I might be influencing them with my own decisions. Thus The Woman Behind the Waterfall is a novel about 3 generations of women and the difficult choices they make, set in a Ukrainian village. I believe that every fact that can be checked in a novel, should be checked and should be accurate. It is a sign of professionalism and it is part of the trust between a writer and a reader. You ask the reader to pay money for your work, but you have to make sure they are getting a well-written, professionally edited book. For my own novels, I have spent a great deal of time and money travelling to collect the correct facts to make each scene accurate. There are plenty of elements in fiction that don’t require any research, but anything that does – needs to be done. 4. Given the sensitivity of the subject it must have been very challenging to write this book. Can you share your experiences while working on this novel? The Woman Behind the Waterfall deals with quite serious depression, both post-partum depression and general depression bordering on alcoholism. I certainly channeled my own deepest and darkest emotions for some of the scenes of the book – I am a very emotional person so I can experience quite extreme highs and lows (not too often, luckily). I have been rewarded by this as quite a few readers who have also suffered from depression have written to me saying they found the book incredibly moving and helpful. These kinds of reviews and words are really special. For me, the greatest challenge was publishing my first novel. When you are just starting out, you really don’t know what the reaction to your work will be and it’s quite terrifying. I didn’t know if it was the right decision to publish, or if I should throw the novel into a dark drawer and write another one, but I eventually made the decision and went ahead with it. I was lucky that there was a positive response to my novel, but it could have been the other way round. It’s quite terrifying to put your professional work out in the public so openly. It’s part of what makes being a writer such a difficult job. My favourite character is the seven-year-old Angela. I have two children, and one of the most wonderful things is to watch children playing when they are young, as their minds have not yet been closed in by the “facts” of the surrounding world and they truly exist in a state of pure imagination and possibility. I was fascinated and inspired by watching this in my own children and I wanted to write about it in the character of a child. Thus, Angela is a girl who sees no boundaries between her imagination and the world around her – she flies in the body of a bird, she becomes the wind, she enters a storm – she is pure spirit and possibility. I suspect she will always be my favourite character. I absolutely love experimenting with genres. In The Woman Behind the Waterfall I mix Literary Fiction with Magical Realism, with some elements of Jungian psychology and surrealism, as well as some time-shifting. In my next book The Unity Game I mix thriller with Sci-Fi with some fantasy elements, but also under the cloak of Literary Fiction. Bending genres is one of the things I enjoy most as a writer. I’m currently working on my third novel and also some shorter works. I’m hoping to release it in 2018, but you never know when something will be ready. It could be 10 years after that! For my readers: thank you for taking a chance on my work, and please write a review. Reviews not only help an author with their career, but they also help writers to understand what their readers loved or didn’t love in their work. It’s the only feedback we get as writers and it’s invaluable. So please, share your thoughts with writers if you have read one of their books. For aspiring authors: the main thing to do is write, write, write. Learn how to complete a piece of work professionally. Set a word count (short story, novella, poem, novel), then write the first draft. Edit the work as well as you can. Then let it go. Write another one. It will be better. Then write something longer. This way, you build up confidence in your ability to work professionally, and also learn to grow and develop your skills.